(CNN) - Mitt Romney's making another endorsement, and this time it's in a crucial Senate race in his own backyard. CNN has learned that next week the 2012 GOP presidential nominee will endorse Scott Brown, the frontrunner among the Republican candidates hoping to challenge Democratic Sen. Jeanne Shaheen of New Hampshire this November. "It gives me a great deal of pride to announce that Governor Mitt Romney will be in New Hampshire on Wednesday, July 2nd to formally endorse my campaign for U.S. Senate. Together, we will rally with Republicans and those who want to make a difference in this election," Brown says in an email that his campaign will send to supporters Tuesday morning. Romney's very well known in New Hampshire. He owns a vacation home there, has often appeared at GOP events in across the state, and was governor of neighboring Massachusetts. Romney easily won the Granite State's 2012 Republican presidential primary, but lost New Hampshire by six percentage points to President Barack Obama in the general election. Since his defeat in the 2012 presidential election, Romney has taken on the role of Republican Party elder statesman, in hopes of helping shape the future of the party. And while he has made endorsements in a number of GOP primary battles this cycle, he's only appeared on the campaign with candidates a couple of times. Most recently, he traveled to Iowa to campaign with state Sen. Joni Ernst, who earlier this month went on to win the Hawkeye State's Republican Senate nomination. In his email, which was obtained by CNN, Brown goes on to say that "I know a lot of you feel the same way I do: Our country would be in much better shape if Governor Romney were in the White House today. Governor Romney was right about so many things, whether the subject is the still-sputtering economy, an aggressive Russia moving to expand its sphere of influence, or the vacuum left in Iraq by the failure to leave behind a residual force to secure our hard-fought gains." And Brown takes a shot at Shaheen, adding that "President Obama's allies in the Senate, including Senator Jeanne Shaheen, have supported his disastrous policies to the detriment of the American people." According to the Brown email, the event will take place at Doug and Stella Scamman's Bittersweet Farm in Stratham, near the New Hampshire seacoast. That's the same spot where in June 2011 Romney formally announced his 2012 bid for the White House. Brown, a former senator from neighboring Massachusetts sold his home in the Bay State late last year and moved his residency north to New Hampshire, where he owed a vacation home and where he spent much of his childhood. In April he formally launched his Senate bid in New Hampshire. Brown joins two other Republicans who are running for their party's Senate nomination in New Hampshire: former U.S. Sen. Bob Smith and former state Sen. Jim Rubens. Conservative activist Karen Testerman dropped out of the race earlier this month and endorsed Smith. The winner of the September 9 primary will face off against Shaheen, who also served for six years as the state's governor. Two polls released last week indicated Brown trailing Shaheen by 10 and 12 percentage points. One of the two surveys also suggested that Brown was the clear frontrunner for the GOP nomination. Shaheen's campaign went up with a new television commercial Tuesday that tells the story of how the senator helped a New Hampshire homeowner keep her house. In the ad, registered Republican Ursula Gordon explains that Shaheen personally helped after her after husband got sick and she faced losing her home. Shaheen's campaign says the spot – there's 60 second and 30 second versions – will run on broadcast and cable TV statewide. Brown, then a little-known state senator, in Massachusetts, scored an upset victory in a special election in January 2010 to serve the final three years of the term of the late Democratic Sen. Ted Kennedy, who had died the previous summer. Brown lost his bid 2012 re-election bid for a full six-year term to Democratic challenger Elizabeth Warren. 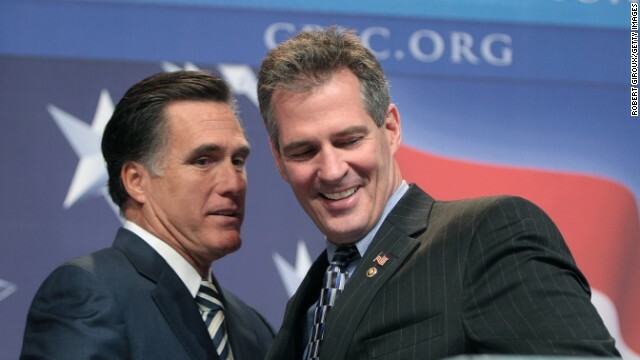 During the 2012 campaign, as Brown tried to fend off the challenge from Warren in blue state Massachusetts, appeared to distance himself a bit from Romney, who Brown considered a political mentor during their days together in Bay State politics. Last year, Brown passed on running in a special election in Massachusetts to fill the term of John Kerry, who left the Senate to become secretary of state. And at the time, Brown also announced that he wouldn't make a 2014 bid for an open governor's seat in the Bay State. Brown made a number of speaking appearances at GOP events in New Hampshire last year. Last fall, in another hint about a possible run, he dropped the 'MA' from his Twitter handle. Since late year, when he began considering a Senate bid in New Hampshire, Brown began been highlighting his ties to the Granite State, to push back against Democrats' characterizations of him as a "carpetbagger" from Massachusetts. If Brown ends up winning the GOP's September primary and runs a competitive race against Shaheen, it would expand the map for Republicans. Democrats hold a 55-45 majority in the Senate (53 Democrats and two independents who caucus with the party), but are defending 21 of the 36 seats up in November, with half of those Democratic-held seats in red or purple states, like New Hampshire. We don't like rich flatlanders coming in here and buying up our lake front and seaside properties, and we don't like them trying to buy our Senate seat. Brown will probably try Florida next. Bring out the dancing horses, and we will horse-dance in the Gangnam Style as The Mitt allows us to share in his money and privilege for a time. Will this give Scott Brown the win? Ah, no, but it will give him golden memories to treasure along with the selfies they took. Dance, Scott Brown, dance! For now your revels are ended, and your fitful time upon the stage is up. You have strutted and fretted and will at last be seen no more, except in underwear ads in women's magazines. That is the kiss of death for opportunistic Brown. Other than a brain transplant he doesn't stand a chance. No more secret meetings with Kings and Queens. I knew Brown could get a big name endorsement also from his home state. Not to shabby for a first time NH candidate. I just thought of a strategy ..... Obama should start endorsing GOP candidates.... this way the gop will not vote for them. Am I not allowed to point out that Scotty seems to be afraid of real work and is simply looking for a government handout?? This is the 5th post you've zapped. People can say the nastiest things about the POTUS and FLOTUS, but I can't point out this dude seems scared of a real job. How does this help Brown? It seems to me it just shines a spotlight on the fact that Brown is a carpetbagger from Massachusetts when his big endorsement is from a fellow Massachusetts Republican. I hope Shaheen's people are smart enough to capitalize on this one. They seem like such a cute couple! Look at 'em takin' the selfie. This gay marriage thing has really changed things -oh, they're not? But they look so happy. Maybe they can patch things up. Holy Rubber Ducky!, There is that Romney guy again threatening to take away your Food Stamps! Hey you should have elected Mitt when you had the chance! Then you wouldn't need Food Stamps! Dang it, I hate when somebody is right !! The 47 Percent is going to find out what real work is!! And ain't you glad!! I hope Brown wins. We need to get control of the senate from the democrats before they completely give away the country. They are headed that way. "It's soft, white, tasteless, fully of empty calories, and malleable!" Romney "Like me, Scott has no principles and can change his 'beliefs' at the speed of light." What an awfully long article ... filled with nothing of interest whatsoever. Yeah, I know. New Hampshire is Romney's second home state (or is it third ... perhaps maybe even fourth?) and Brown considers New Hampshire he one true home state (after Massachusetts). I hope Brown loses. We need to get control of the right wing extremists in the senate from the republicans before they completely destroy our country. They've been headed that way since Nixon. Ron, that is a good idea. I wish I thought of that. Obama should encourage the Republicans to vote for moderate candidates who have a chance of actually doing something once they get to Washington. Republicans will do the opposite just to spite Obama. This will finish the Republican Party for sure. 😀😀😀 I love Wonder Bread.... Or I used to....before Hostess closed down. Run for your life, Romney. They are going to drag you back into this, pump up your vanity and drain your bank account, and leave you by the side of the road bruised and beaten. Get on the Car Elevator and escape. Leave Scott Brown to face the music alone. Well, if a Romney backing isn't the kiss of death for a campaign, I don't know what is. Our country needs a Republican Senate majority to provide further checks and balances to this lawless President. Sounds like the kiss of death. Romney is batting 0-2 so he would be in the minor league. No Chance he wins in NH. We won't allow this pretty boy represent us. He should get a real job but can't stand giving up the limelight that POLITICS has cast him in.